(Bloomberg) -- U.K. Inflation is back below the Bank of England’s 2 percent target for the first time in two years, providing officials with further reason to refrain from raising interest rates as Brexit fears grip the economy. Consumer prices rose a less-than-forecast 1.8 percent in January from a year earlier, down from 2.1 percent in December, the Office for National Statistics said Wednesday. It was the smallest increase since January 2017. The figures are a boost for consumers, who were squeezed by the sterling-induced inflation surge after the 2016 Brexit referendum and now face an uncertain future outside of the European Union. With wage growth at its strongest in a decade, workers are once again enjoying real spending power. Pressure on inflation last month came from cheaper auto fuel, as well as a sharp fall in gas and electricity costs after price caps imposed by the energy regulator came into force on Jan. 1. These were partly offset by air fares and ferry-ticket prices, with post-Christmas discounts failing to match those seen a year earlier. Consumer prices overall fell 0.8 percent, compared with 0.5 percent in January last year. The slowdown has proved much sharper than the BOE expected. In November, it predicted inflation would average 2.2 percent in the first quarter. It now forecasts just 1.8 percent, with the rate staying below target for the rest of the year. Real wage growth is supporting an economy under strain amid fears that Britain is heading out of the EU on March 29 with no deal to cushion the blow. Investment fell the most in a decade last year, dragging down economic growth. 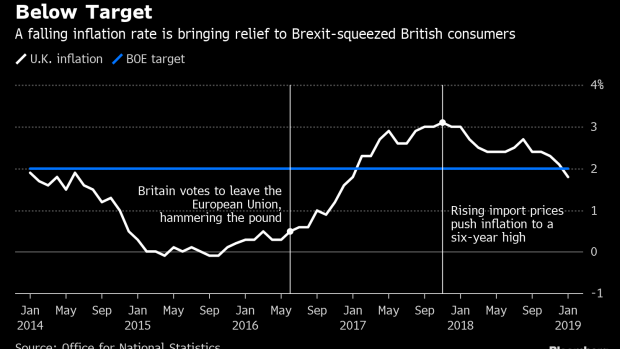 With domestic cost pressures building, the BOE says further rate increases will eventually be needed, though officials last week sent a message that nothing will happen until the “fog of Brexit” clears. Core inflation, which excludes volatile food, energy, alcohol and tobacco prices, stayed at 1.9 percent in January, as forecast. The last time underlying inflation was higher than the headline rate was in November 2016. Producer input prices fell 0.1 percent from December, taking the annual rate to 2.9 percent. Output prices rose 2.1 percent on the year. Brexit fears continued to take a toll on the property market, with annual house-price growth slowing to just 2.5 percent in December, the least since July 2013. London, the worst- performing region, saw values decline 0.6 percent, the first decline over a calendar year since 2008.